Mumbai: India’s central bank will act to aid an economic recovery and rein in inflationary expectations, governor Duvvuri Subbarao said. “We will take into account the need to support the recovery and contain inflationary expectations," Subbarao said in Gangtok. “We will do and act what in our judgment is best for the economy." “We will, as in the past, manage the government borrowing programme to the best of our abilities and ensure that the markets function in an orderly manner," Subbarao said. “There’s no plan to reduce or increase the borrowing plan." 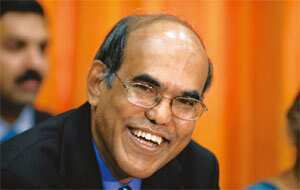 The Reserve Bank has no target for open-market bond purchases in the coming months, Subbarao said. It had a plan to buy Rs80,000 crore of existing securities in the first half of the fiscal. “There’s no programme to carry the balance in an arithmetical sense in the second half of the year," he said, referring to the unfinished portion of the debt-purchase for the six months through September. “Should it be our judgment that we need to do open-market operations for a purpose, we will do it," he said. “We have not indicated a programme as we believe that that is no longer necessary because there’s so much liquidity in the system."